Made during the heart of the Art Deco time period this brooch displays strong symmetry with a more soft geometric design. 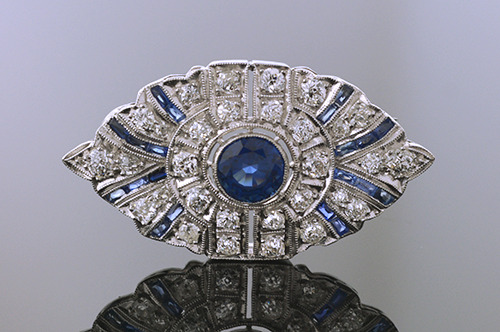 The sapphires accent the design and call attention to the diamonds. This piece is in excellent condition. Bezel set in the center is one round brilliant cut sapphire that has a weight of approximately 1.28 carat. Accenting the center are 30 old European cut diamonds that have a weight of approximately 1.00 carat total weight. These diamonds have an average color grade of G-H and an average clarity grade of SI(1-2). Highlighting the design are 20 rectangular French cut sapphires that have a weight of approximately .35 carat total weight. This brooch is made of platinum circa 1925-1930.